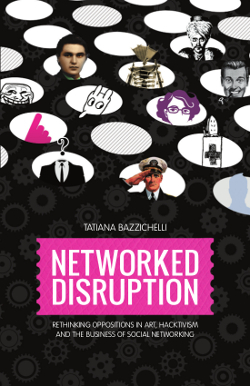 Essay by Tatiana Bazzichelli: “If You Can’t Hack ’em, Absorb ’em or the Endless Dance of the Corporate Revolution”, published in Concept Store nr. 3, journal by Arnolfini Contemporary Art Gallery, Bristol, UK. Get the issue here. Get the PDF here. Read the full text below. What were once the values and philosophy of the hacker ethic are since some years the domain of many of the business companies which represent the development of Web 2.0 and contributed to create the notion of social media. According to Steven Levy, the first one to use the term hacker ethic as described in his book Hackers: Heroes of the Computer Revolution (1984), the hacker ethic was a “new way of life, with a philosophy, an ethic and a dream”. A philosophy, which had its own language and rules, and its own representative community, whose roots went back into the 1950s and 1960s, crossing the activity of the hackers at the Massachusetts Institute of Technology (MIT) and in the Seventies, the rise of the sharing computer culture in California (well represented by the Community Memory Project in Berkeley and the Homebrew Computer Club in Silicon Valley). Embracing the ideas of sharing, openness, decentralization, free access to computers, world improvement and the hand-on imperative (Levy, 1984) the hacker ethics has been a fertile imaginary for many European hackers as well, who started to connect through BBSes in the Eighties. At first glance it may seem evident that business enterprises in social networking and Web 2.0 built their corporate image by re-appropriating the language and the values of the first phase of hacker culture – a language once very representative of certain networking art practices as well, from mail art to net.art. Tim O’Reilly, one of the main promoters of the Web 2.0 philosophy, and organizer of the first Web 2.0 conference in 2004 (San Francisco), wrote in the fall of 2006: “Web 2.0 is much more than just pasting a new user interface onto an old application. It’s a way of thinking, a new perspective on the entire business of software” . However, both what has been called Web 2.0 since 2004 (when Dale Dougherty came up with the term during a brainstorming session) as well as the whole idea of “folksonomy”, which stand behind social networking, blogging, and tagging, are nothing new. According to the software developer and venture communist Dmytri Kleiner, these forms of business are just a mirror of the economic cooptation of values of sharing, participation and networking which inspired the early formation of hacker culture and peer2peer technology. As he pointed out during a panel at the Chaos Communication Congress in Berlin in 2007, “the whole point of Web 2.0 is to achieve some of the promises of peer2peer technology but in a centralized way; using web servers and centralized technologies to create user content and folksonomy, but without actually letting the users control the technology itself” . But even if the Web 2.0 business enterprises do not hide their function of data aggregators, they make openness, user generated content and networking collaboration their main core strategies. The user contribution becomes a key of market dominance. Google was one of the first companies to base its business in involving users to give productive feedback, releasing beta versions of its applications, such as Gmail for example, to be tested by users without being formally part of the production process. This idea of perpetual beta (Tim O’Reilly, 2006) was well anticipated by the bazaar method of Eric S. Raymond (1999), as the capability to create software and other products of intelligence and creativity through the collaboration of a community of individuals acting to make communication channels open. Raymond’s well-known essay, The Cathedral and the Bazaar , is an obvious support of the open source “cause” (Raymond is co-founder of the Open Source Initiative) but also an apology of greater involvement in the free market. His metaphor juxtaposes the methodology of open source and its deterritorialization of development (the bazaar method) to the one of free software, often developed in laboratories or closed group of programmers (the cathedral). This text, considered controversial by many hackers for being heavily negative towards the work of the Free Software Foundation, created a shift from the idea of open source as user rights of free infrastructures, well explained instead by the Free Software Definition and the Open Source Definition, to the one as a model of networked collaboration, “not only referring to computer programs, but evoking broader cultural connotations” (Florian Cramer, 2006). Shifting the target from users to producers this vision focuses more on business opportunities than on an ethical idea of software distribution. It doesn’t put the accent on the concept of freedom and rights to users stressed instead by the free software movement, and makes open source more a branding than a philosophy; same conceptual trick used by the Creative Commons initiative, as Anna Nimus (aka Joanne Richardson and Dmytri Kleiner)  and Florian Cramer pointed out in 2006 . A predictable consequence of Raymond’s networking vision emerges when Tim O’Reilly, involved since the early time in the Open Source Initiative, openly refer to what he calls the “open source paradigm shift”, showing the business advantages in building applications on top of open source software. This shift implies the idea of building modular architecture to allow cooperating programs, encouraging Internet-enabled collaborative development, having users as co-contributors, and creating viral distribution and marketing (Tim O’Reilly, 2007). The idea of applying collaborative software development in Web 2.0 companies therefore becomes a strategic business advantage without stressing the accent on the rights of users, but making life easier for producers, with consequent decreases in costs. Many companies have adopted the bazaar method and the open source built-in communities model, from IBM, Google, Apple, Facebook, to Creative Commons, and Wikipedia is not out of this cloud. Writing about the problem of intellectual property and the producer-consumer dichotomy which the CC licenses don’t resolve, Anna Nimus pointed out: “What began as a movement for the abolition of intellectual property has become a movement of customizing owners’ licenses. Almost without notice, what was once a very threatening movement of radicals, hackers and pirates is now the domain of reformists, revisionists, and apologists for capitalism. When capital is threatened, it co-opts its opposition” (Anna Nimus, 2006). This shift of the hacker principles of openness and collaboration into commercial purposes is the mirror of a broader phenomenon. We are facing a progressive commercialization of contexts of software development and sharing, which want to appear open and progressive (very emblematic is the claim “Don’t be evil” by Google), but which are indeed transforming the meaning of communities and networking, and the battle for information rights, placing it into the boundaries of marketplace. The artistic works by Aaron Koblin, based on crowdsourcing and the Amazon Mechanical Turk, are good examples of this phenomenon of aestheticization of networking practices, which become part of the business field . Many of the social networking platforms try to leave an image of themselves as “a force for good”, and so does Google . At the same time, the free software community is not alien to this progressive corporate takeover of the hacker counterculture. Google organizes the Summer of Code festival every year to get the best hackers and developers to work for the company ; it encourages open source development, supports the development of Firefox, funds hackerspaces – i.e. the Hacker Dojo in Mountain View. Ubuntu One, an online backup and synchronization utility, uses Amazon S3 as its storage and transfer facility – while the Free Software Foundation bases its GNewSense, a free software GNU/Linux distribution, on Ubuntu . This ambiguity of values, which is contributing to the end of a time of digital utopias, is well described by Matteo Pasquinelli: “a parasite is haunting the hacker haunting the world” (2008), analyzing the contemporary exploitation of the rhetoric of free culture, and the collapse of the “digitalism” ideology, corroded by the parasite of the cognitive capitalism . However, there are other possibilities for analyzing the matter, which probably once again could open a field of action for artists and activists. The question is whether the co-optation theory of the counterculture might be the right explanation to understand the present development, or better, implosion, of the hacker – and networking culture. Thomas Frank’s first book, The Conquest of Cool. Business Culture, Counterculture, and the Rise of Hip Consumerism (1997) and Fred Turner’s From Counterculture to Cyberculture. Stewart Brand, the Whole Earth Network, and the Rise of Digital Utopianism (2007) may show the way. Both books analyze how the endless cycles of rebellion and transgression are very well mixed with the development of business culture in Western society – specifically in the U.S.. As Thomas Frank suggests “in the late 1950s and early 1960s, leaders of the advertising and menswear businesses developed a critique of their own industries, of over-organization and creative dullness, that had much in common with the critique of mass society which gave rise to the counterculture. The 1960s was the era of Vietnam, but it was also the high watermark of American prosperity and a time of fantastic ferment in managerial thought and corporate practice. But business history has been largely ignored in accounts of the cultural upheaval of the 1960s. This is unfortunate, because at the heart of every interpretation of the counterculture is a very particular – and very questionable – understanding of corporate ideology and of business practice” . According to Frank, it is evident that much of the business innovation in menswear and advertising pushed by Madison Avenue prepared the way for the rise of the Sixties counterculture, whose critic of the mass society presents similar bohemian thoughts. The American counterculture of the Sixties was very much based in mass culture, promoting “a glorious cultural flowering, though it quickly became mainstream itself” (Frank, 1997) and becoming attractive for corporations, from Coca Cola to Nike, but also for IBM and Apple. Fred Turner explains how the rise of cyberculture utopias is strongly connected with the development of the computer business in the Silicon Valley, as the background of the Whole Earth network by Stewart Brand and the magazine Wired might show . It shouldn’t surprise today that Google is adopting the same strategy of getting close to the counterculture – hackers, burners at Burning Man, etc. – because many hackers in California were already close to the development of the business we face today. The cyber utopias of the Eighties and Nineties were pushed by the market as well, and they were very well connected with its development. Fed Turner demonstrates how the image of the authentic counterculture of the Sixties, antithetical to the technologies, and later co-opted by the forces it opposed, is actually the shadow of another version of history. A history which instead has its roots in a “new cybernetic rhetoric of systems and information” born already in the research laboratories of World War II in which scientists and engineers “began to imagine institutions as living organisms, social networks as webs of information” (Fred Turner, 2007). Once again, with the Web 2.0 enterprises, we are facing the same phenomenon. Accepting that the digital utopias of the Eighties and Nineties have never been completely extraneous to the business practices, might be an invitation for artists and hackers to subvert the false idea of “real” counterculture, and to start analyzing how the cyclic business trends work, and what they culturally represent. Analyzing how the hacker culture became functional to accelerate capitalism, as it happened for the youth movement of the Sixties, might change the point of view and the area of criticism. The statement “if you can’t beat ’em, absorb ’em” could be reversed from the artists and hackers themselves. If hackers and activists can’t avoid to indirectly serve corporate revolutions, they should work on absorbing the business ideology for their own advantage, and consequently, transforming it and hacking it. A possible tendency might be not just refusing business, but appropriating its philosophy once again, making it functional for our purposes. Some artists are already working in this direction, creating art projects with deal with business and which subvert its strategies, like The People Speak (Planetary Pledge Pyramid, 2009), or Alex Shulgin (Electroboutique, 2007), UBERMORGEN.COM (Google Will Eat Itself, 2005, and Amazon Noir, 2006, created with Paolo Cirio and Alessandro Ludovico; The Sound of Ebay, 2008), the community of Seripica Naro (2005), just to mention a few . Even if it is easy to recognize co-optation as a cyclic business strategy among hackers and activists, it takes more effort to accept that business has often been part of counterculture and cultural development. In this phase of ambiguity, it is fundamental to look back to analyze the reasons of the shift of networking paradigms and hacker values, but it is also necessary to break some cultural taboos and avoid dualistic oppositions. Artists should try to work like viruses to stretch the limits of business enterprises, and hack the meaning of business itself. Instead of refusing to compromise with commercial platforms, they should try to put their hands on them, to reveal hidden mechanisms of social inclusion and exclusion, and to develop a critique of the medium itself. Once again adopting a strategy proper of the hackers, hacktivists should directly face the economy, which has made these strategies its core business. Anna Nimus, “Copyright, Copyleft and the Creative Anti-Commons”, Berlin, 2006. Florian Cramer, “The Creatiuve Common Misunderstanding”, 2006. “Social Media – A Force for Good”, Panel Discussion with Stephen Fry, Biz Stone, Founder and Chief Executive of Twitter; and Reid Hoffman, Founder and Chief Executive of LinkedIn. 19 november 2009. As Florian Cramer made me notice discussing about Ubuntu in a private e-mail correspondence. Matteo Pasquinelli, Animal Spirits. A Bestiary of the Commons, Amsterdam, Institute of Network Cultures, 2008. Thomas Frank, The Conquest of Cool. Business Culture, Counterculture, and the Rise of Hip Consumerism, Chicago University Press, 1997. Fred Turner, From Counterculture to Cyberculture. Stewart Brand, the Whole Earth Network, and the Rise of Digital Utopianism, Chicago University Press, 2007. Respectively: www.pledgepyramid.org; http://electroboutique.com; http://gwei.org; www.amazon-noir.com; www.sound-of-ebay.com; http://serpicanaro.com.